that you’ve lost track of time? I’m not a shopper but once in a while I get the urge to venture out for that item I’ve researched about online. 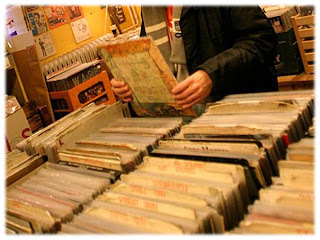 I used to buy a lot of music and I would lose an afternoon flipping through thousands of vinyl albums ending the outing with a handful of new treasures. This is SOCIAL media, right? I did that online this morning except it wasn’t music shopping, it was profile reading. I try to do this at least once a week. There’s no sense collecting friends, followers and connections like dusty trinkets on a mantle, I like to find out more about these people who followed me back and see why we’re connected. Just stop writing on a wall or tweeting for a moment and read some profiles, click on a few websites, allow yourself the fun ride of learning more about those around you. Then go back to home base and click through another profile. I have lost count the number of people who ask me “what are you up to lately” while it is explained in one form or another on over twenty social media profiles. They simply didn’t take a moment to find out for themselves. And I'm guilty of doing the same. We are connecting at the speed of light, clicking and following in an instant. Take the time to find out the magic that may be behind those associations. Sift through someone’s pages, discover how they portray themselves online and you may even get a business idea or two. You may even want to contact them in person. Shocking! Find a moment and move outside of your tight circle of real friends and examine what others are up to and you will discover some very cool people. You may even lose track of time doing something fun. There is endless chatter about sustained engagement and two-way conversations but are we really doing it? Pick five people in your network whom you don't converse with on a regular basis and get to know them. Collecting all those albums was a pointless exercise if I didn't listen to the music. Stop and look through their profile, visit their website and read their bio. You will meet some interesting people you didn't know you knew. Are you ready to discover who’s out there?